Even the occasional dip deserves some extra attention. The bathing ritual. Do you have one or want one? Do you dream of soaking in a claw-footed masterpiece or will something that holds water do the trick? Is the time of day or night essential to your routine and the lighting an important element? Do you even have a routine or is a bath just an annual affair? And how about the temperature, scalding so that it cools to bearable or lukewarm so you can build up to a fine warm winter blanket? 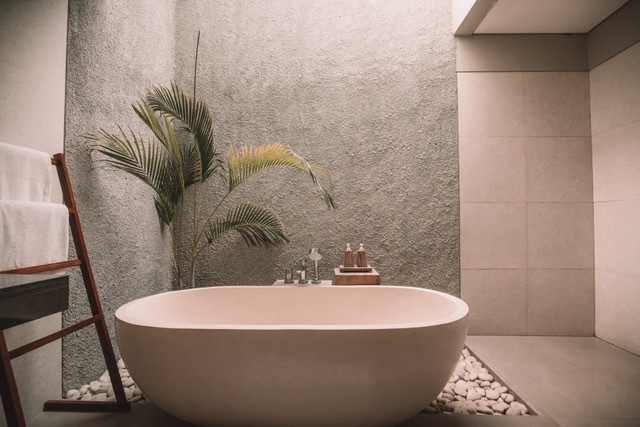 A bath vs. a shower is the perfect way to get more slow living into your living and the health benefits can be a value- add to just feeling good after a long day. As long it is not dangerously hot, a nice soak can lower your blood pressure and improve your cardiac function, but if you are hoping to re-hydrate your skin, what you do after you step out of the tub is seriously vital—slather on oil or lotion while still damp. History tells fantastic stories of women and their bathing rituals, Cleopatra wasn’t the only one to enjoy the daily dip. Even if you are an occasional dipper, be queenly and add a little candlelight or lovely scented oil to your bath party as it will certainly elevate the ritual.